"Out and not coming back..."
I was really excited to run this race because it is always fun to run outside of your home town. However, after my experience at this Rock ‘n Roll race, I will probably not return to run this race next year. After running the San Diego Rock ‘n Roll and seeing the expo there, I had high hopes for Los Angeles. Finding the expo was the first challenge for me. The Los Angeles Comic Con took up the majority of the Convention Center, and there weren’t any signs to point you to the correct space for bib pick-up. Luckily, a kind security guard (he third person we had to ask) was able to point us in the correct direction. Packet pick-up itself was quick and easy, once you found the place. The actual expo was a disappointment. There were barely any booths there. The Rock ‘n Roll gift shops took up 3/4 of the expo space and there wasn’t much to see or do. I walked through the whole expo in 10 minutes, max. The next morning, it was time to trek to the start line. I appreciate how quick it was to get to the race via foot from my hotel. Because of this, I didn’t have to deal with parking, so I have my much say on that aspect. The start line itself was organized well. The corral numbers and pacers were easy to spot amongst the crowd. The only issue I had with the starting ceremony was the audio issue. I had a corral number near the back; I couldn’t hear the National Anthem being sung and I couldn’t tell the race actually started. This isn’t a significant issue, but I feel it detracts from the whole race experience. 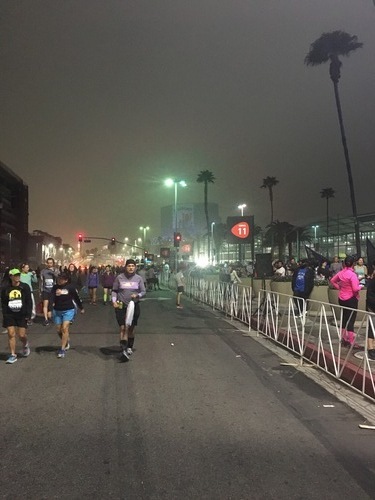 Once the race started and I was able to start running, I was excited to run the streets of Los Angeles. The course itself was two long out-and-backs that went through business districts with nothing exciting to see. I felt the streets were fairly crowded due to being split in half to create the out-and-back course, which caused me to lose my pace group. There were a few areas where the road conditions weren’t the best, but I expected this as we were running in a busy metropolitan area. The last half of the race had significant hills, so make sure you’re prepared! Throughout the course there were an adequate number of aid stations and the volunteers were cheerful. There weren’t as many spectators along the way as there are at other races, but the girl singing in that military band made up for everything with her rockin’ vocals. Once nearing the finish line, the crowd of spectators grew and provided the extra energy needed to complete the race. It was cool to finish right next to the Staples Center. After passing the finish line, there were plenty of snacks being handed out. (It would have been nice to have an available bag to store everything in until people could reach the gear check, but c’est la vie.) The medal was angel wings surrounding the LA cityscape, which was neat. The actual post-race festival was okay. There were a few more booths and another gift shop. The performers were random and I hadn’t heard of them. Not many people were sticking around to listen to them as the space in front of the stage was empty. I figured since it was LA they could have gotten someone a little more known/better, but oh well. I only stuck around for 5 or so minutes before heading out. Overall, I can finally say I ran the streets of Los Angeles, but I won’t run this race again unless I get a free pass or a significant discount. I’d rather try a different Los Angeles area race with a better course. The AFC race is one of my favorites in San Diego. You start at a Nationals monument and end at a historically San Diego location. I don’t think any other race parallels the views seen on this course. Firstly, the expo is easy to access on Harbor Island and I like how they allow you to pick up bibs for others. (Sometimes work duties call and it’s tough to make it to packet pick up.) Luckily, this time I made it to the expo. I thought there was a decent amount of freebies and photo opportunities to make the expo worthwhile to walk around. They also had running fuel/apparel available for purchase, which was nice for any individuals who had last minute needs before the race. Packet pickup itself was quick, painless, and easy! I thought the shirt given to registered runners was of good quality, too. The day of, parking was well organized. I opted to park at the finish and shuttle to the start. If I recall correctly, they do have limited parking about a mile from the start which they will shuttle you to from the finish. Personally, I feel parking at the finish is the best way to go as Balboa Park does not lack any spaces. There are plenty of shuttles and the shuttle locations are easy to spot. (There are two different shuttle locations for runner convenience.) The shuttle drivers are nice and efficient, and it’s nice to not have to trek to the start as you have to in some races. I hopped on a later shuttle (whoopsie) at around 5:00 and barely made it to the start on time, so do plan on arriving earlier than expected and don’t wait for the last shuttle. The start had gorgeous views of the San Diego Bay and there was some room to warm up. You won’t have enough space to go crazy with your warm up, but there is enough space to stretch. Also, they have plenty of portable bathrooms available for use at the start. I feel it’s a rare occurrence when a race gets this right, so huge plus from me. Once the race started, there was some bottlenecking before the start line due to a narrowing of the road, but it was nothing unbearable. The course starts down some gentle, rolling hills next to the military graveyards (still with that beautiful view of the water) and transitions to Point Loma neighborhoods where people cheered the runners on. Next you ran by the airport, around Harbor Island, and into downtown. The next part of the race took you up some hills in the downtown area into Balboa Park. At the finish line there were plenty of spectators cheering on he finishers. You received your medal and a goodie bag filled with some snacks. The post race hunger was real after this run, so it was nice to have the snacks quickly given to me. The finisher festival was on a grassy area in Balboa Park where you could visit booths, pick up any gear you had checked, and take photos. I didn’t stick around for this, so I can’t speak much on it. My favorite part of this all was the ease of getting out of the area. 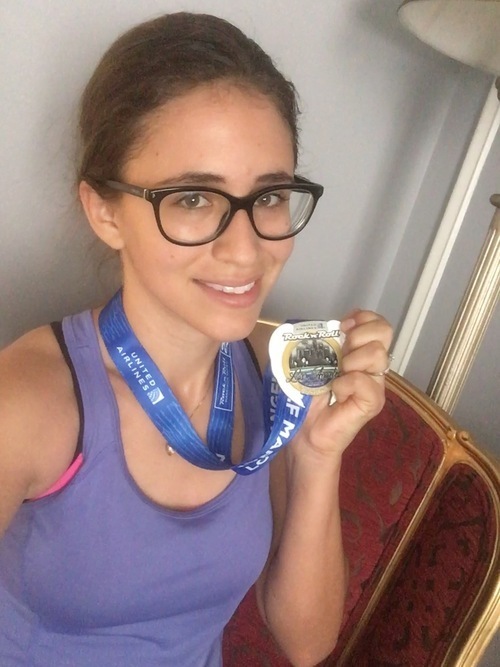 Some half marathons create huge traffic issues when leaving the race, but it took me all of five minutes to get out of the area and on my merry way. Huge plus from me for this. Overall, the views of this race are gorgeous and the race organization is top-notch. I have zero complaints for this race (minus the heat some years, but that’s not the race’s fault) and I cant wait to run it in 2018 to get that snazzy “three consecutive year” medal. Overall, the Rock ‘n Roll Half Marathon in San Diego is such a fun race and I highly recommend it. The expo is held at the Convention Center, which is in the middle of the downtown district so parking can be tough to find (or spendy). I opted to park at a trolley station (free!) and pay $5 to take the trolley to the Convention Center. While it isn’t the quickest way to get there, it does provide a great opportunity to people watching. The expo itself was quite standard. It had your freebies, photo opportunities, and most importantly, race bibs! The staff was quick and efficient at the bib pickup station, and that is all I could ever ask for. Before I knew it, race day arrived. Again, I parked at the trolley station and took the trolley downtown. Once I arrived, I just followed the masses of people from the trolley to the start. (I’m directionally challenged.) If you do opt to take the trolley, leave 30 minutes earlier than you think to allow some wiggle room in case there are issues with the trolley. I remember some people missing their corral start times and yelling at the staff, which isn’t fun for anyone. At the start, there was a DJ playing music and everyone lined up according to their corral numbers. There was some miscommunication between the volunteers at one point regarding the placement of the corral numbers. It went from 27 to 31 to 35, etc., but who cares because everyone was going to run the race regardless. Along the course there were plenty of aid stations and a ton of people around cheering the crowd on as they raced. There were a few places where people set up bars and offered shots and other liquor options to help “numb the pain.” One mile was dedicated to fallen soldiers, which I thought was very thoughtful and added to the uniqueness of the event. Throughout the course there were a few bands, but I thought there would be more music involved. The energy of the volunteers and the spectators was very contagious and helped me when I was running on empty near the end. In regards to the race support, I felt that they had enough first aid stations and water stations for an event of this caliber. A few more restrooms at the start line to decrease the length of the lines at the port-a-potty station would be nice. The end you receive your medal and walk to the Waterfront Park to partake in the post race festivities, grab other medals you may have obtained (Remix Challenge, etc), and enjoy live music, beer, and FOOD. They had a wide variety of food trucks where oh could purchase food. The area was perfect to kick back and hang out after the race. The only downside is the traffic leaving the race. If you drove, then plan on traffic due to the road closures for the marathoners. If you took the trolley, then you should be able to avoid the trafficked area. If you have never run a half marathon and are looking for a fun first experience, then this is your race. "Fun and family friendly run..."
This race is one of my favorite races of the year in San Diego which benefits the San Diego County Crime Stoppers Reward Fund. It’s a fun cops and robbers themed race in which you can run either as a cop/robber team (in or out of costume) or individually. Before the race was held at Balboa Park, but it has recently moved to Liberty Station. The Liberty Station course is flat and easy for all ages to run, including stroller runners. The start of this race is my favorite. They stage a jail break with a police helicopter flying overhead and sirens sounding off. The robbers of the cop/robber teams are started and begin their run. Three minutes later the gun sounds again and the cops are let loose to chase down their robber counterpart. All others (and walkers) start immediately after the cops. During the race, if a cop catches a robber, the cop and robber “handcuff” together and finish the race with each other. The top 25 cop/robber teams get an extra goodie bag. The course itself is flat and smooth and goes around a park. There isn’t much else to say about the course besides that water is provided before and after the race. Since it is a 5k there isn’t need for much else. There are plenty of booths to look through before and after the actual race. They have nearby restaraunts for food and they have food booths as well. One year they provided free tacos for participants, and I wish they brought that back! Overall, if you love themed runs that fund a good cause (community safety) then this is your race. It’s easy so it won’t ruin any training plans and it’s fun for all fitness levels and ages.